Motorbikes of all historic, vintage and antique brands are welcome to join in and strut their stuff. Bring on the Italians, Americans, Brits, Asians, Germans, and more. Since 2012 motorbike friends, collectors and enthusiasts have met on the hill above the serpentine of Pittsburgh’s Schenley Park during the annual Pittsburgh Vintage Grand Prix. Take in the vintage races and car shows from one of the best vantage points in the park under the cool shade of the trees. In keeping with the spirit of the PVGP, all classic, vintage, antique and historic racing motorbikes are invited to participate in the show which runs from 9:30 am until 5:00 pm Saturday and Sunday. The entry fee is $10 per day or $15 for the weekend and includes exclusive motorcycle entrance to the park and all day parking. Your participation in the show contributes to the PVGP charities. Enjoy the weekend’s event under the shade trees and refreshment tent above the serpentine turn of the race course while relaxing with a fascinating mix of two-wheeled icons of the near and distant past. 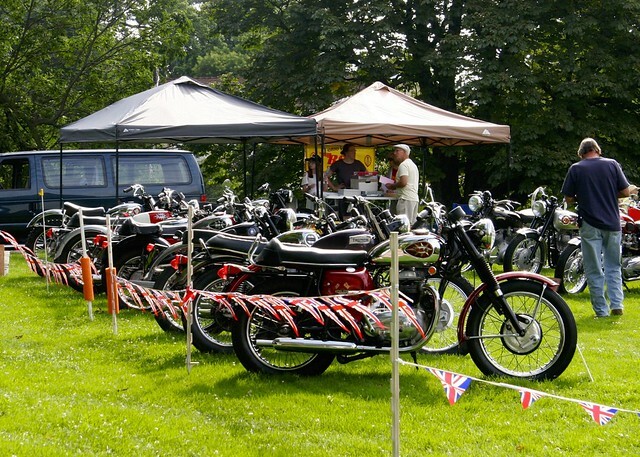 The Pittsburgh Ton-Up Club manages the PVGP’s Motorbike Show. They are vintage motorcycle enthusiasts with a passion for primarily British bikes, Rockabilly, and the Rockers subculture. The PVGP is excited to have them on the team and looks forward to another great year. The Ohio Valley BSA Owners Club, with great help from Bud and Barb Kubena, are staging another can’t miss, British Bike Exhibit this year. Concours-worthy bikes from BSA, Triumph, Matchless, Velocette, Sunbeam, Norton and Triton will be on display. If you would like to participate please get in touch with Bud & Barb Kubena. Day of show registration is available. please enter from Darlington Road. There is no overnight camping available and limited trailer parking – please inquire. The show takes place on the corner of the golf course along Darlington Road and East Circuit Road. See map below. Please enter from Squirrel Hill into East Circuit and directly into the park. You can preregister or pay at the gate. A PVGP vendor will be nearby all weekend selling food and drinks. We want to thank Tip Paul and the Moto Guzzi Club for establishing the PVGP Vintage Motorbike Show and growing it into a thriving event. Tip is stepping down as the director of the event after 5 years but he promises to be there with his bikes…he deserves a chance to sit back and enjoy what he has helped create.